Kanye West was booed by festival-goers on Friday night after he launched into an extraordinary '20-minute rant' in the middle of his Wireless set. The Yeezus rapper caused confusion when he paused his performance at the London music event, held at Finsbury Park, to preach to the crowd about discrimination within the fashion industry. Wearing a bejewelled mask over his face, Kanye, 37, told the audience: 'I'm not going to mention any names but... Nike, Louis Vuitton and Gucci. Don't discriminate against me 'cos I'm a black man making music. And it would seem the move didn't go down too well with the crowd, with audience members reportedly deserting the al fresco gig in droves. One festival-goer said: 'He was laying into the 'machine' and ranting about the public's perception of him. Hundreds of people left the park early because they were so bored of his long rant. Some fans also took to Twitter to express their annoyance at the fact that the superstar rapper halted his performance to get on his soapbox. Kanye - husband of Kim Kardashian - was the headline act at Friday night's Wireless, which also saw the likes of Pharrell Williams, Foxes and Ella Eyre take to the stage. The star is now also headlining the music event on Saturday night after Drake was forced to pull out due to illness. The Hold On We're Going Home hitmaker released his own statement which said: 'To my beloved fans, it truly breaks my heart that I won't be able to perform as planned at Wireless and Roskilde this weekend. 'I got sick a few days ago and although I am on my way to bouncing back, my doctors have made it clear that I am not physically fit to fly or deliver the performance my fans expect and deserve from me. 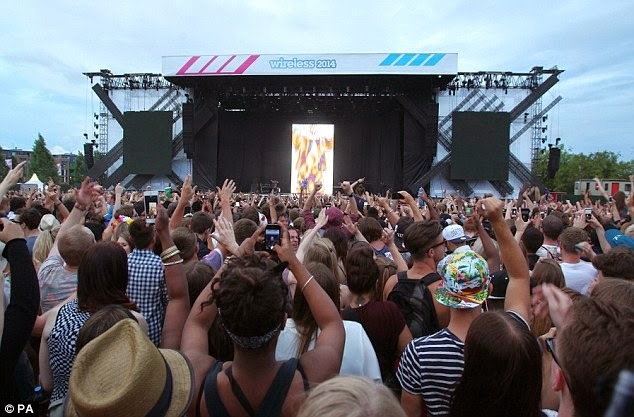 The festival, which previously enjoyed several successful years in Hyde Park, will this year span two sites V Festival-style - one in Birmingham and one in London.